The species Homo rudolfensis was originally proposed in 1986 by V. P. Alexeev for the specimen KNM ER 1470. This species was given the name after Lake Rudolf (now Lake Turkana), northern Kenya. The best-known fossils of H. rudolfensis come from the area surrounding this lake and date from about 1.9 million years ago. 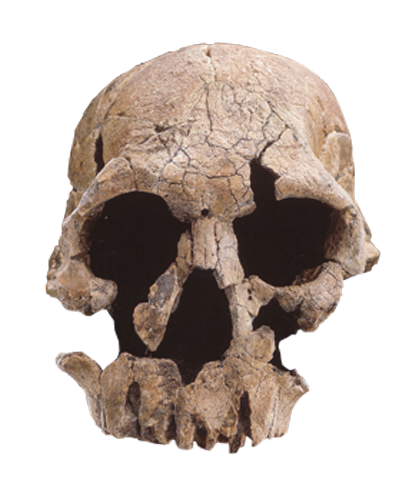 Much uncertainty surrounds the debate of H. rudolfensis or H. habilis being the ancestor to the later species of Homo. H. rudlofensis can be described as a slightly dimorphic species (males stood approximately 5’3″ and 132 lbs. vs. females at 5′ and 112 lobs.) with a 700 cc brain (EQ of 3.25). Specimens display a cranium with a broad, flat face, sagittal crest, and no distinct brow ridge. Dental remains suggest a parabolic palate with post canine tooth reduction. H. rudlofensis sites have been associated with Oldowan style tools.